Tekorin the NEKO: Yatta---! 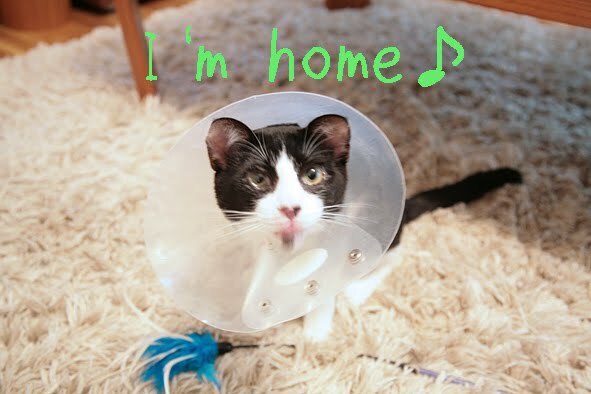 I'm home!! 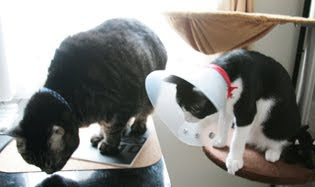 I can remove this Elizabethan collar. so mommy's photos are all out of focus. I am SORRY for her. Now I'm doing fine and doing great as before! When I went to the vet this morning,Tekorin seemed so depressed pushing his head to the corner of his room behind the kitty toilet. When I called his name,slowly he turned his head and recognized it was me! He was clinging on me while I was waiting to check at the vet. Our veterinarian told me that he behaved really good before the surgery. He is always a naughty kitty at home so that was a surprise. But the vet told me she thinks he is very smart to behave like that. Oh I'm so proud of him if he really is! No No No he was NOT just scared to be naughty!! He was a brave kitty. ha ha ha!! 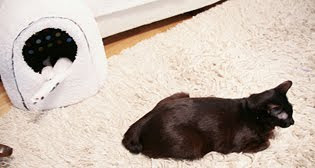 After coming back home, he was running all over the house and went kissing to B-sensei and Ku-suke,got a very special treat,and went to pee for a looooong time. He kept jumping and leaping with that Elizabethan collar on! It seems he was showing us how happy he is to be back at home. 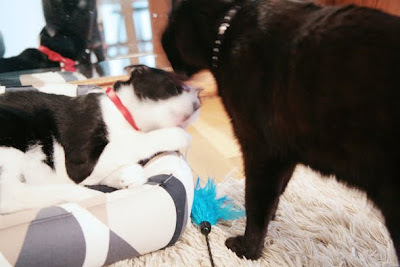 After a while,Ku-suke suddenly seemed irritated by Teko and they started fighting . And Ku-suke really really hates that Elizabethan collar. Maybe that's why. Then at last,they fell asleep. We spent last night in silence. it was more like 14 missing in 17 amigos. And B-sensei and Ku-suke seemed dislike each other like before without Teko. It is very interesting that Teko came to them like a cupid. We are so happy he got over the "N" day. THANK YOU for your warm and lovely support. I'm glad all went well!! Great pictures, love the cone. You will be back to normal before you know it and I am so happy things went well! YAY for you, Teko!!! We are so happy effurything went great and that you're back home! That's a bad moment to go through but a real necessity to be a happy cat ! Teko looks so cute ! I don't understand why he has to wear this awful collar ? None of my cats ever wore that after being neutred or spayed. Thank you all for the warm comments again for me! I think I got over it really bravely.YAY! The vet told me if I kept a good boy,mommy can remove this. So I've been a very good kitty today and mommy took it off!!! THANK YOU furriends from the JEWELGIRLS KATZ!! I think I'm one of the Happiest kitty to have furriends like you. Now I'm OK and doing fine with my family.